The sweetness comes primarily from pureed dates, a nutritional powerhouse filled with fiber, magnesium and potassium. Thanks to the hidden greens (spinach!) 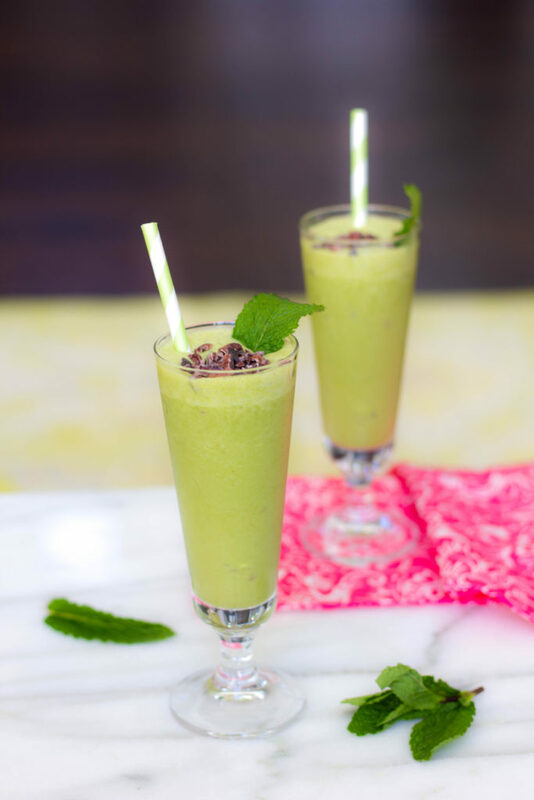 and superfood cacao nibs, this nutrient-packed smoothie should keep you going for a hours. Add all ingredients except for the ice and cacao nibs to a high speed blender (such as a Vitamix) and process on high speed until smooth and creamy. Add the ice and process again. Coconut “Cream”: This is the thick, rich and non-watery part of canned coconut milk. To get the “cream” you need to refrigerate your coconut milk for 5 or 6 hours or pop it in the freezer for at least an hour. Once the coconut milk is cold, carefully remove the top with a can opener and use a spoon to scoop out the hardened coconut “cream” off the top. The “cream” is what you will be using for the Mint Chocolate Chip smoothie recipe. You can reserve the liquid water for other smoothies.